Now right here is the answer to everyones eternal question, ”Am I psychic”? YES, you are! Because everyone is born with a Sixth Chakra. Known in Sanskrit as Anja, the word means perception and that is exactly what the Sixth Chakra is all about: how we perceive ourselves, how we get information the five senses can’t grasp (it ain’t called the SIXTH sense for nothing! ), and how we perceive our own future. 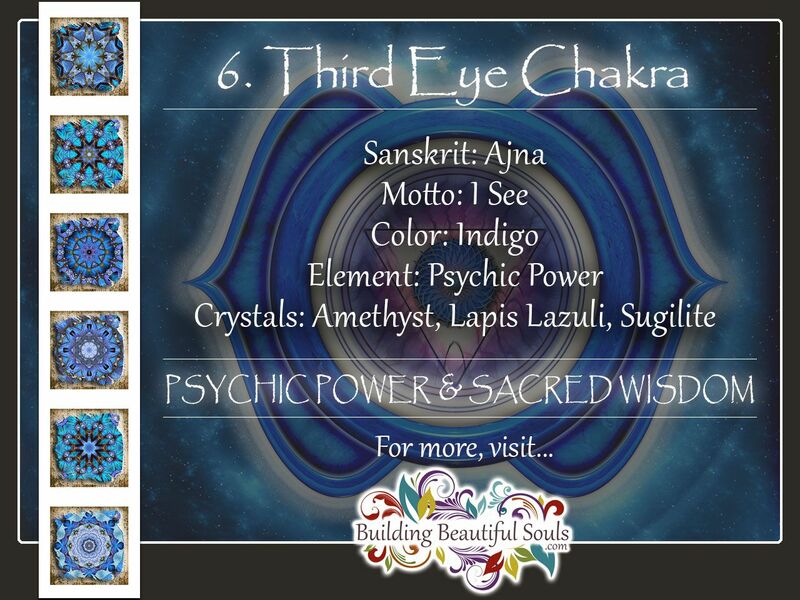 Also called the Brow Chakra or Third Eye Chakra, this energy center deals with spirituality, imagination, insight, intelligence, intuition, ESP, and what are called in psychic work ”the clairs”,  clairvoyance, clairaudience, claircognizance, clairsentience. Ever hear that phrase about seeing it in your mind’s eye? Right here, baby! When your Third Eye Chakra is open and really seeing, it makes dreams more accessible. If you are working with meditation, the stronger your Sixth Chakra is, the easier it is to tune in, turn on, and drop out of the everyday world into the Higher Realms. The Brow Chakra is the place where we throw the switch and get those flashes of insight. You know those times when the phone rings and you know who it is? You see something in your mind and a week later it happens just like that? You think about someone and you hear from them that same day? Your Third Eye is open and observing the Unseen World and reporting back to you. It’s also a place where your really big big decisions come into play. Remember it’s the place for imagination. Well, you can’t manifest if you can’t imagine. So this is where you’re encouraged to dream big, dream positive, and see your future exactly the way you want it to be. Finally, it’s the place where you envision and deal with a lot of Life Lessons - the things you set up in your pre-birth planning sessions. The more you can look at what’s happening objectively and plug it into the Bigger Picture, the less likely you are to get caught up in the Illusion of the World (loosely, All The Everyday Stuff That Really Doesn’t Matter If You’re Awake). When your Third Eye Chakra is bleary, your psychic work is out to lunch. Any abilities you have for reading people is completely offline. You probably aren’t sleeping well, and your dreams (when you have ’em) aren’t helping; they can be downright nightmarish. Your eye-hand coordination is shot to blazes. Your mind plays Etch-a-Sketch when you try to learn something new and clears itself without warning and youre back to zero. Oh, baby, it gives ME a headache just listing all that crud. So, how about we find the healers version of a dose of (Third) Eye Drops to clear this puppy? First things first: GET THE SQUIRREL OFF THE WHEEL. Really. Take some time to chill. This is not a time to make major decisions, or try to suss out what’s in the future. Bring yourself right to the present moment and just Be Here Now (thank you, Ram Dass). Try journaling. Not with any particular story line in mind, but use it as a chance to talk to yourself on paper. What are you thinking? Seeing a pattern you don’t like? Dont judge it, but ask yourself what happens if you change it a little bit? A lot? Take a little time to write down all the times you remember when your intuition was cooking with gas. Find those times when things happened that Simply Couldn’t Be Explained and own the fact that you got it right. And maybe you want to start noting down when you get a hit on something and followed it - or didn’t. Food, food food. Always a good thing, we like dark blue foods here, so go have another piece of blueberry pie. How about a bunch of those gorgeous blue-black Concord grapes? And guess what? WINE is the right color, as long as you go for the Beaujolais, Shiraz, Merlot, Cabernet, and other yummy reds on the menu (but dont overdo it; if you drink too much that Third Eye might see those pink elephants right along with you). Spike up those menus with spices and herbs like poppy seed, rosemary, and mint. We see a warm bath in your future, especially if you ad some lavender, frankincense, patchoili, clary sage or jasmine. Drink a cup of jasmine tea as you lazily watch the flame from your indigo blue candle. And we always recommend getting your thoughts to support you. My intuition is my partner in creating my world. I access my deep wisdom with clarity and joy. I perceive the world in positive and imaginative ways. I see my future, and it is good. A visualization to use when you need to Get Into Indigo: put yourself on a mountaintop under that same night sky you saw earlier. Feel the breeze. Let it blow gently against your face and forehead. Feel it sweeping away all the cobwebs, all the crazythink. Listen to the sound of the stars. Feel yourself expanding up into that night sky, until you are literally sitting in space, with all that twinkling energy around you. And feel the invisible Beings around you  guides, angels, anybody you want to have that Celestial Wine Break with. Remember that you can also look down to the earth and envision it whole and healthy and serene  because thats your future youre looking at when you do. Dark blue, that’s you, when you need Sixth Chakra Balance. Indigo velvet gloves. Dark blue satin shirts. Whatever is that blue, it’s you, and wear it to keep yourself open to the Infinite. Now, you know you need to meditate. Kind of like you need to shower and brush your teeth. It’s one of those daily maintenance things that keeps us in good shape all the way around  but it’s especially important to keep your Sixth Chakra sharp and clear. It doesn’t have to be fancy, either; just take ten minutes to Be Where You Are. Use some ambient music in the background if you want to (those brain-balancing MP3s are terrific), sit spine straight and concentrate on that spot in the middle of your forehead. Just keep seeing it clear, dark blue and glorious like a summer night sky. This is another place where Alternate Nostril breathing is really helpful, too (though not while youre meditating). Sit in a comfortable position, and hold your nose with the thumb on the right and your index finger on your left. Close the right nostril. Breathe (gently!) in through the left. Then release the right, close the left, and breathe out. Now reverse it - close the left, breathe in through the right, then close the right and breathe out through the left. (It’s not as hard as it sounds, really.) This is calming, centering, and gets those cells all oxygenated. And absolutely go for the Dark Blue Bling. Wear those gorgeous crystals and gems! Earrings, necklace, even a teardrop with a shimmering blue stone at the center of your forehead. Be daring, be delicious, be Dark Blue! In no particular order of Awesome, we suggest Amethyst, Angelite, Azurite, Blue Tourmaline, Celestite, Fluorite, Iolite, Lapis Lazuli, Sapphire, Sodalite, and Sugilite. When your Third Eye Chakra is open and observant, you get to see everything that’s in the world (and Not Quite There). It’s the best way to see the future you want. 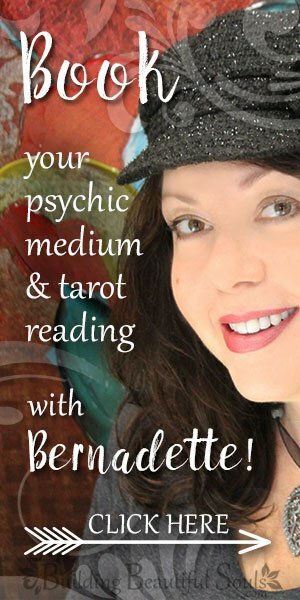 And next time someone asks, “Are you psychic?”.  Well, you’ll know what to say before they ask!